The ReAction Figure Movie! Vintage Darth Vader's quest for a new team of Bounty Hunters. Playing with ReAction figures from Funko is probably the funnest thing I have done all month! Lots of classic 80's characters to choose from. More strange review combos with Transformers Hero Mashers Soundwave and Star Wars The Black Series Darth Vader. Both are pretty cool toys, just really different. Mega Bloks running away with the Despicable Me universe. After seeing how they enhanced SpongeBob Squarepants, this will be awesome fun with the Minions! Power Rangers Dino Charge Megazord T-Rex, Stego and Tricera Zords! The Power Rangers Dino Charge Megazord is already pushing the Power Rangers Super MegaForce off the shelves. It always amazes me how fast the turnover rate for new seasons of Power Rangers happens. Dino Charge is the 22nd season for Power Rangers in the USA. Its great to see the Zords going back to their roots again (and again) with Dinosaurs, as that is how it always should be! 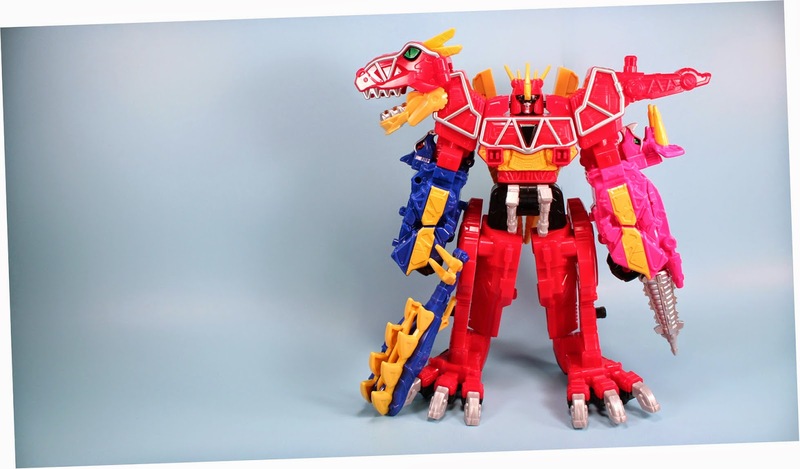 This Megazord is only a three team Zord builder though. There will be more sets to use the Zord Builder interchangeable toys, but it would still be nice to build up to five, we will see. The gimmick this time are Chargers, that activate a small action feature, like a flip up sword or drill. Nothing to exciting, but will open the wallet to collecting more things. The Pink Tricera Zord is really bright Pink! The mouth on Tricera and Stego open really wide for the Charger (and to bite clamp onto Megazord). Looks fun and cool. Start seeing these toys appear late on shelves 2014 and onward! Go go Power Rangers!